Special thanks to Ginna Mueller for her assistance. The community of Cambria and the guests at The Bridge Street Inn enthusiastically turned out for the hour and half show. Here are some of the highlights from concert. If you are a performer of the arts and think The Bridge Street Inn would be a good venue for your show contact me at bridgestreetinn@yahoo.com. Despite what the Cambria visitor magazine says about fast food. Cambria does have fast food. 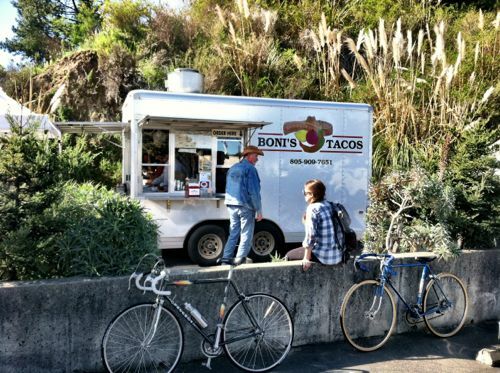 It’s just fast food Cambria style. Special thanks to Amanda Darling for a little video work. Here’s a link to The Bridge Street Inn website so you too can enjoy fast food Cambria style. Recycling has a nice jingle when made into a coat. Tim Andreae, Boise musician, shares this beautiful soundscape. CLICH HERE to listen to Tim Andreae’s latest recordings. 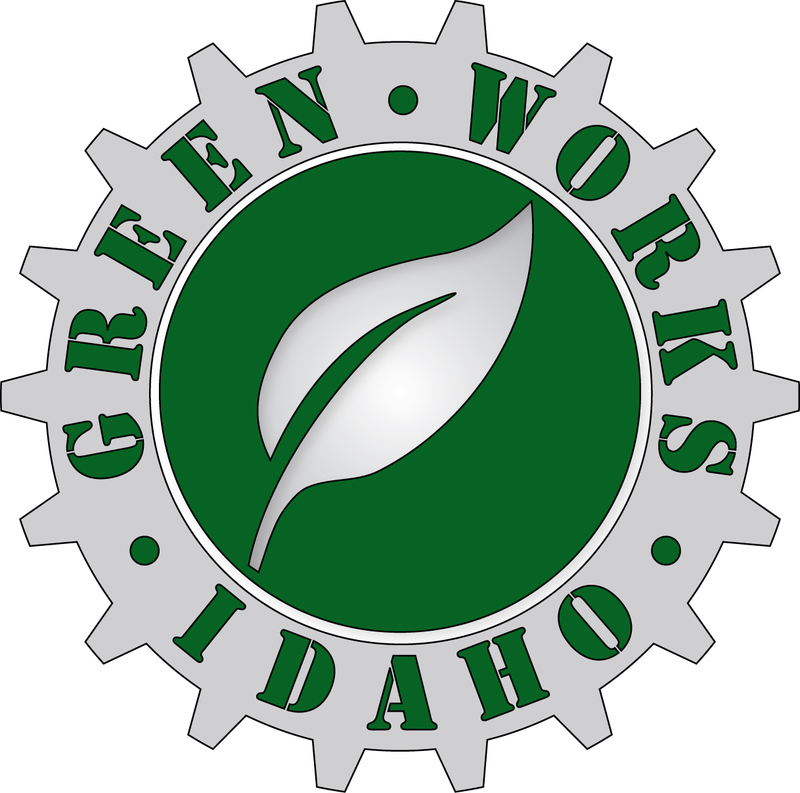 CLICK HERE to learn about Green Works Idaho projects. Prohibitionist believe drinking beer leads to lewd and immoral behavior. Casey O’ Leary demonstrates drinking beer in a responsible sustainable manner, betters the community and results in delicious eggs. With a reputation for fresh flavors, Maxine’s Glacier City Bistro fills with locals every Wednesday Night for open mic tunes. Traveler Brandon Follett checks out the scene and indulges in two of his favorite pastimes — eating and singing. Girdwood, Alaska has some of the best day hiking in all of Alaska. Before heading back to the hostel, I recommend taking a walk through the Alyeska Resort. Half the fun of being a budget traveler is splurging at restaurants like Sakura & Sushi Bar. Anchorage Daily News offers a great written description of the trail here. The hostel managers at Girdwood Alaska Backpackers Inn love spinach. With the help of Jacqueline Kennedy Onassis the hostel has grown a delicious crop of spinach. When traveling on a budget and can’t afford a professional guide I recommend a goat. Traveler Brandon follows a friendly goat through the wilds of New Mexico. The dairy goats roam freely on a unique configuration of private and public land, (like the checkerboard pattern that Tony Hillerman writes about in his books about the Four Corners). The goats roam and graze and return home in the evening. Coonridge Organic Cheese’s delightful taste comes from the type of plants the goats graze on in the high New Mexico desert. Check out my goat adventure story called, Yum Yum Colostrum: A Volunteer Experience at Coonridge Organic Goat Dairy. 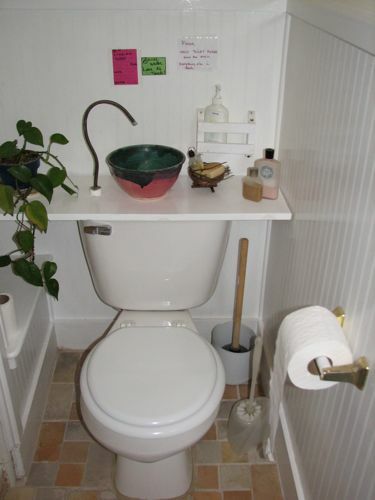 Aimee Wyatt explains the Bridge Street Inn’s approaches to water conservation, including directions on how to make a lid sink. Check out the Bridge Street Inn Hostel in Cambria, California.